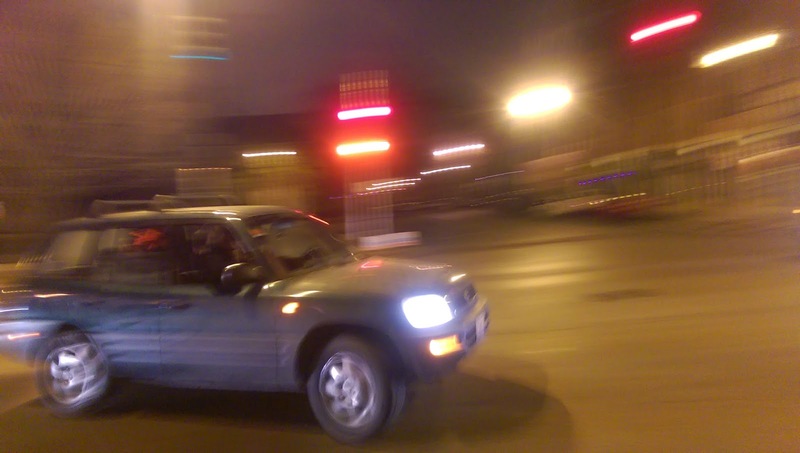 A robbery victim took this picture of an older model RAV4 get-away car in Roscoe Village Saturday. Targeted in a Roscoe Village robbery this weekend, a North Center man managed to take a picture of the offenders' getaway car as they circled the block after jumping him. The victim, who has asked to remain anonymous, wrote to CWB Monday in the hopes that "it helps get some of these guys off the streets." The actual attack occurred on Paulina between School & Melrose - a block and a half north of Belmont. I was completely blindsided and tackled from behind by two men yelling to give up my money, the other men were in the RAV4 that soon picked them up and sped away…A gentleman in a Jeep (cut-off by the RAV4) stopped to see if I was okay. I headed toward Belmont, encountered a girl walking solo north on Paulina... and advised her not to head that direction alone as I had just been jumped a block up. As she turned back to find a friend at The Pony, the RAV4 sped around the corner from Belmont - with the occupants screaming at bystanders at the bus stop, etc. It turned on to Paulina and headed [north] This is the point in which the photos were taken (both attackers were among the occupants in the car). To clarify, the car did not circle around prior to the attack [as we previously reported]... it was afterwards. At that point, I called CPD, and was surprised in the quick response - probably due to the events from [Wednesday evening]. First responding officers were in an unmarked Explorer, who saw the photos and immediately headed North in pursuit. Two additional CPD cruisers arrived shortly thereafter. I wasn't discouraged at all from filing a report. It was a personal decision not to file - since no property was taken. They asked a couple of times if I wanted to... or, if I'd at least serve as a witness if anyone was apprehended. Police reported the offenders' descriptions to be be 5 or 6 black and Hispanic men. According to police in the neighboring 20th district, about 30 minutes after the man was jumped in Roscoe Village, a 7-Eleven store in the 1700 block of Foster was robbed at gunpoint by a group of 4 black and Hispanic men. The store is located 3 miles due north of the Roscoe Village scene.